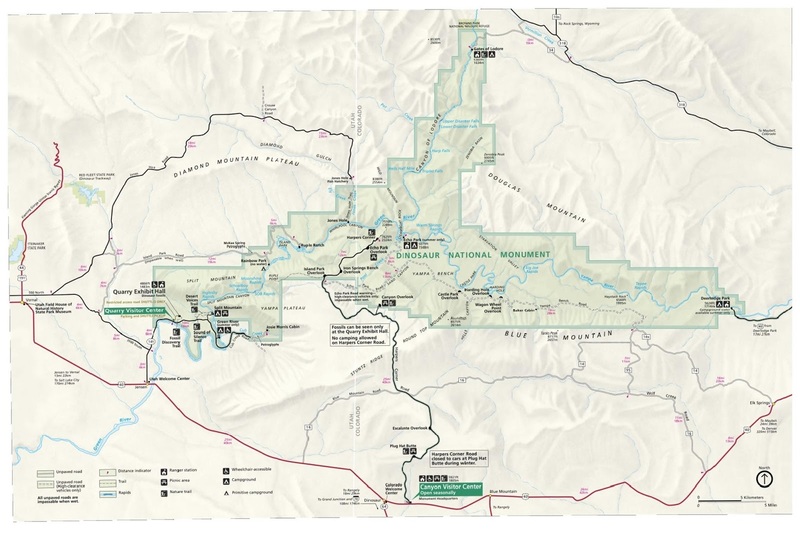 The Desert Voices trail is located within the Utah Section of the Dinosaur National Monument. The trail begins near the boat launch in the Split Mountain campground. The well constructed trail seems to have been built with school age children in mind. With striking views of Split Mountain the trail passes through several layers of different colorful rock formations making for a very pleasant hike. With the aid of a connector trail Desert Voices can be combined with the Sound of Silence trail for a longer hike. With the trailhead being near the boat launch parking can get a little congested but a spot can usually be found easily enough either along the road or closer to the campground. The trail starts out following a dry wash where the water table is probably not far below the surface being close to the river. Desert Voices is an interpretive nature trail with signs for both children and adults. The gray signs are for adults and the tan signs were designed 'by children for children'. The trail is a loop hike with the loop beginning about 1/4 mile from the trailhead. The sign on this end of the trail suggests hiking the loop in the counter clockwise direction. If you come at the trail via the connector from the Sounds of Silence trail the indication is less obvious so there could be hikers going either way. After the start of the loop the trail eventually leaves the wash and begins a gradual climb up the side of the hill. Near the top of the ridge the trail is met by the connector. The trail signs give the length of the Connector trail at a half mile while the website gives the length at a quarter mile. 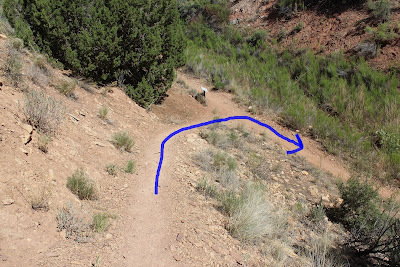 The trail crosses the ridge through a gap in the crest as the trail is looping back toward the trailhead. The landscape on the south side of the ridge is completely different with more grass and sagebrush and less bare ground. The trail recrosses the ridge and gets to what might be the funnest part of the hike. The well designed trail works its way down the hill winding around boulders and junipers easily managing each obstacle that it comes to. We spotted a nice looking coyote on the hill above the wash but it was gone before we could get a picture. Some of the best trails seem to end too soon but fortunately Dinosaur National Monument has more of a variety than just its desert hikes. If you walk around the hill on the river side you may be able to find some of the pictographs near one of the caves. There is a horse head that appears to be a more recent addition along with more vandalism but if you are wondering about rock art there is some there as well as in the closed section of the campground. The views of the Green River are very pretty and relaxing as the rock cliffs of Split Mountain rise sharply out of the laminar flow of the water. Campers are drawn to the area in the evening hours to lounge around the boat ramp and the sandy banks of the river. If you would like to see it for yourself then all you have to do is 'Take a hike'.